If your money problems are keeping you up at night, you need to call us, the bankruptcy law attorneys at The Law Office of Robert H. Holber, P.C. Our law firm serves clients in Media, Pennsylvania. For more than 20 years, our law firm's experienced attorneys Robert H. Holber and Nathalie Paul have helped people like you who are in financial distress. Lawyer Holber's practice focuses on Chapter 7, Chapter 11 and Chapter 13 bankruptcies, foreclosure and alternatives and bankruptcy and divorce. He is also a Chapter 7 trustee, giving him practical insight into how your bankruptcy trustee might view your case, helping your case to be as successful as possible from day one. Lawyer Nathalie Paul's focus in our law firm is Social Security Disability claims, a source of income for many people in recent years, especially when their unemployment runs out. Our clients cover the economic spectrum, from the elderly widow whose only asset is a small life insurance policy to the electronics engineer earning six figures or more. Bankruptcy can affect anyone. 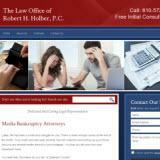 The Law Office of Robert H. Holber, P.C., in Media, Pennsylvania, stands ready to help you through your financial problems. Whether you are best served by filing a Chapter 7, Chapter 11 or Chapter 13 bankruptcy or choosing an alternative to bankruptcy, you will receive the best possible personalized plan for your situation, bringing you out from under your financial problems, once and for all.